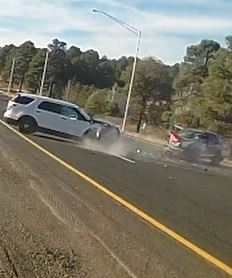 The latest gem is a driver who initially came to the attention of police when they “began receiving calls reporting a reckless driver in a Nissan Rogue traveling on the sidewalk and nearly striking several vehicles along Milton Road in Flagstaff.” Police stopped the vehicle but the driver fled, ending up going wrong way on I-40. This is on a Saturday (11/17/2018) afternoon around 3:30pm. So much for the theory that dangerous drunk driving is limited to middle-of-the-night on the weekend. Hooray for the DPS who acted with bravery to protect the public. The driver Patricia Rose Carvalho, 32 of Los Ranchos, NM faces a litany of charges: attempted second-degree homicide, aggravated assault, endangerment, aggravated DUI and child abuse. News item: DPS releases video of wrong-way SUV hitting sergeant’s car, suspect had child in back seat. Read the DPS press release.